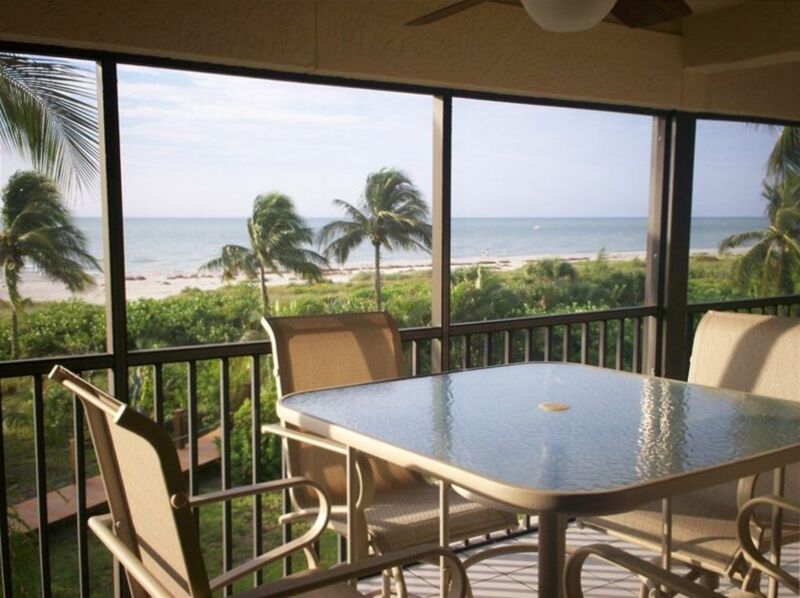 Located on Sanibel Island, our unit at the Sanddollar is a spacious 1,660 sq. ft. Luxuriously furnished gulf front condominium. Two bedrooms plus den, 2 full bathrooms. Our unit has a 26' screened-in porch overlooking the ocean. Exceptional view of the ocean from the living room and master bedroom. Master bedroom has a king sized bed, twin beds in guest room and a queen sized sofa sleeper in den. Den closes off for privacy. Saturday to Saturday rentals. The Sanddollar is a low density complex consisting of three buildings, twelve units in each building. Location is centrally located on the island - Middle Gulf Drive. The complex is very well maintained, with lush tropical landscaping surrounding buildings. We have three tennis courts, a nice sized swimming pool and two patio areas with gas barbecue grills. We have a strict limit of six people in our unit. No pets & no smoking please. Two telephones, Air Conditioning and heat, Three Cable TV's, Two VCR's, CD/DVD player, Fully equipped Kitchen with breakfast bar, Full Sized Washer and Dryer in the unit, Gas Grills (BBQ) Saturday to Saturday rentals. Pros: The condo is located very close to the beach, its a quick walk to the ocean and the view through the balcony is lovely. It's nicely located within Sanibel Island, close to many shops and restaurants. Cons: The kitchen and various other appliances are outdated. The condo is somewhat small, especially the kitchen. Additional note: When we arrived, there was a terrible case of red tide happening in the Gulf of Mexico. Many dead fish in the ocean and on the shore, and it was unsafe to enter the ocean. Though it's not the owner's fault, I highly recommend any folks interested in vacationing in Sanibel look up potential beach hazards/red tide status before booking a condo, as few owners will issue refunds for things like red tide. Our kitchen appliances are older, but work fine. Replacing them is on our upcoming "to do" list. We feel that 1,660 sq. feet is a spacious condo and the fully equipped kitchen is an appropriate size for this space. Red tide has been coming and going for a while in Florida. There is no way to predict when it will be present. As you know, we donated our condo this week to charity, and did not receive any money from you. I offered you a discount if you would like to return in the future. I have refunded people in the past if they were not able to stay because of red tide. Gorgeous views, everything we needed inside! My husband and I, as well as my sister and her husband, stayed at the Sanddollar condo over the 4th of July holiday week and had a fabulous time. The moment you walk into the unit, the views of the ocean just call to you. The huge screened in deck/porch is the perfect place for breakfast, for a book, for watching a passing storm, or just listening to the waves. A ceiling fan on the porch makes it super comfortable, even on the hottest days. Inside we had everything we needed. The kitchen was totally stocked with all the pots, pans and dishes necessary for making a big meal, there was enough room in the living area for everyone to spread out, and the bedrooms were great. Only downside was the mattress in the master has seen better days. The unit also has its own full size washer and dryer, which is super convenient. Outside, the condo grounds can't be beat. It is a low density complex, so there were never too many folks around. The elevator always seemed to be on our floor when we needed it. Also, the pool is just next to the unit's building and was the perfect place to cool off after a morning at the beach. The grounds also have numerous outdoor showers and hose pipes for rinsing feet and shells. Finally, the barbecue grills next to the pool were so clean and modern they almost felt brand new. I'm usually one that avoids using community grills, but these were an exception to my typically hard and fast rule! And I'd be remiss if I didn't mention all the great animals we saw -- rabbits are all over the island, and several seem to live right on the property. There's a beautiful bush in front of the building that attracts gorgeous butterflies of all colors. And adorable lizards roam about, as well. The beach can't be beat. Never super crowded -- even on the holiday itself. TONS of shells. We saw dolphins and pelicans and all sorts of birds every day. Just an amazing experience all around. Would recommend this unit to anyone! Beautifully decorated and well kept. I loved my stay here, we were very comfortable. Everything was super clean and updated. I’m pretty picky and I was very happy that I felt comfortable here. This is the perfect condo! The location is perfect, it's steps away from the beach and the view is amazing! The condo has everything you need and the patio and view are amazing! We loved having the large patio that extended to the master bedroom. It was so nice waking up every morning to the sunrise and seeing the water and beach. I would highly recommend this condo and we look forward to coming back! Thank you so much for the nice review! It was a pleasure dealing with you.